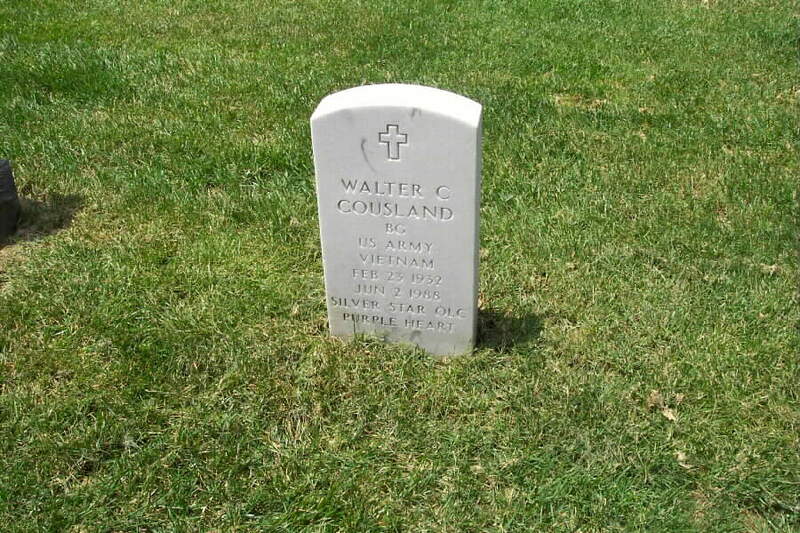 Walter C. Cousland, 56, a retired Army Brigadier General who had served as an air cavalry officer during the war in Vietnam and in Europe and as Deputy Assistant Secretary of Defense for public affairs before his 1983 retirement, died of cancer June 2, 1988 at his home in Boyce, Virginia. A native Washingtonian, General Cousland graduated from the US Military Academy at West Point in 1953. While serving in the Army he earned a master's degree in English at the University of Pennsylvania. He also attended the Army War College. His military career included duty in the office of the Deputy Chief of Staff for personnel in Washington, D.C., command of the US Military Academy Preparatory School at Fort Belvoir, command of a regiment at the US Military Academy and command of a brigade with the lst Armored Division in Europe. He also was Assistant Division Commander of the 25th Infantry Division in Hawaii and Deputy Chief of Staff for Personnel at Fort Monroe, Virginia. He retired from the Army in 1983. Among his decorations were the Silver Star with Oak Leaf Cluster, the Legion of Merit with two Oak Leaf Clusters, the Distinguished Flying Cross, the Bronze Star, the Meritorious Service Medal, the Air Medal and the Purple Heart. Survivors include his wife, Carol S. Cousland of Boyce; two daughters, Beth Anne Cousland of Boyce and Kim Hunlich of Neustadt, West Germany; one son, Scott Cousland of Houston; his mother, Roma Lucille McTaggart Pierrot of Bluemont, Virginia. ; a brother, C.P. Cousland of Brookfield, Wisconsin; and four grandchildren. February 23, 1932-Jun 2, 1988. General Cousland is buried in Section 7-A of Arlington National Cemetery.